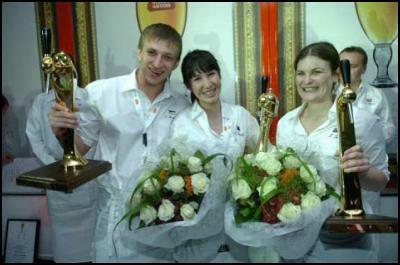 Mozhalov Denys – Ukraine (1st runner-up), Erin Carroll – New Zealand (1st place winner) and Kate Gow - Australia (2nd runner-up). New Zealand Draught Master Erin Carroll (Belgian Beer Café De Post, Mt Eden, Auckland) has scooped the major prize : Winner of the Stella Artois World Draught Masters 2007 in Leuven, Belgium competing against 24 other countries from Kazakhstan to Hong Kong! On Friday 26 October, the Stella Artois Brewery in Leuven, Belgium was host to the eleventh annual Stella Artois World Draught Masters contest, welcoming the winners of 24 locally-held contests throughout the world. The competition took a broad spectrum of international Stella Artois brand ambassadors who reflect the widespread global appeal of Belgium’s premium lager each competing for the coveted title of Stella Artois World Draught Master. After 12 months of training and hard work and up against stiff international competition New Zealander Erin Carroll has won the sought-after title of Stella Artois World Draught Master 2007 taking first place in the competition. Always a fight to the finish, the competition heralds the importance of the Stella Artois 9-step pouring ritual: a cleaning process, the position of the tap (not touching the beer, head or glass), the size of the head (no higher than two fingers), and a careful re-dipping of the glass in cool water to restore its proper drinking temperature – all of which ensure that a Stella Artois will always taste its best. Bottle-pouring finesse and table-serving protocol are also taken into account. The competition focuses on the three Belgian beers : Stella Artois, Hoegaarden White and Leffe Brun. “Without a doubt, a well-poured beer adds something special to the experience and the World Draught Masters goes a long way in showcasing Stella Artois's commitment to quality, the importance of the 9-step pouring ritual and ensuring that Stella Artois is always served at it's best. We're glad that Erin could join us on this journey, celebrating the fine art of pouring a perfect chalice of the world’s most popular Belgian beer and bringing home a big win!" says King. The last time NZ had a world win was in 2002 when Simon McGorman took home the major prize. Last years NZ Draught Master Jason King placed fifth in Brussels but didn’t come home empty handed, he was awarded the People’s Choice award in 2006. Erin receives a free trip to the destination of her choice anywhere in the world. Congratulations Erin! Find more from Stella Artois on InfoPages.